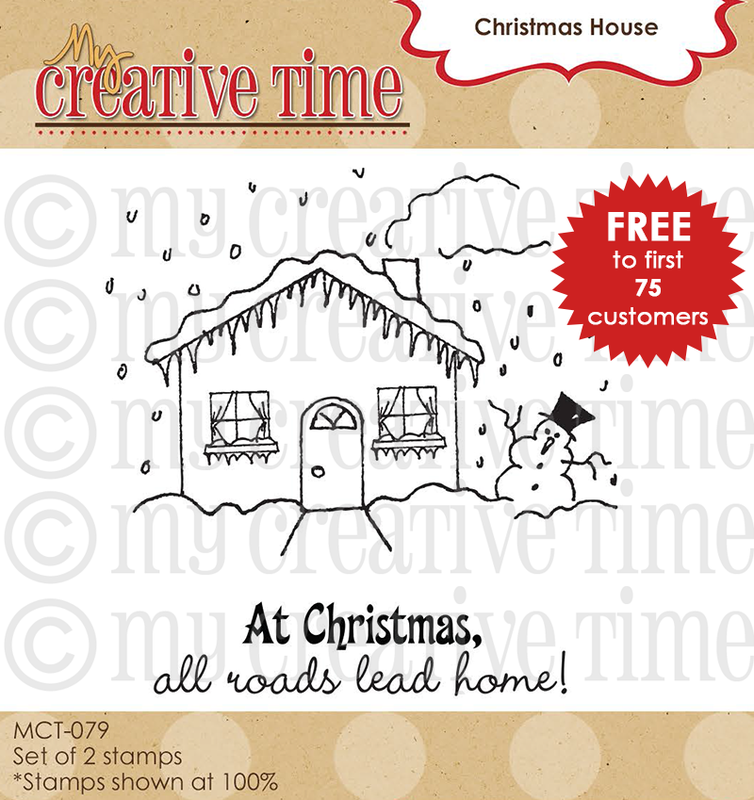 GOOD MORNING my creative friends & welcome to day SIX of our Twelve days of Christmas! OMG! I LOVE MY PROJECT TODAY! (did you hear me yelling that from the top of my lungs! lol.....) I had a dream about this one & the inspiration came from this bottle of wine that one of my hubby's customer's had given him for Christmas! 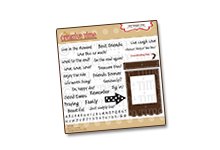 Soooo, I took a nap (that's what you do if you can't think of anything to make) & in my dream, I used my trifold die to make a CUTE tag for this! Then I woke up & put it all together & I LOVE how it came out! First up, here is a close up of my bow using burlap (which I LOVE SO MUCH) & used the cute little glittery red branch which was from my stash AND I made another cute pine cone using my rolled flower die! I thought this sentiment was PERFECT (from "Classy & Fabulous") especially if you are taking this bottle to a friend's house for Christmas! 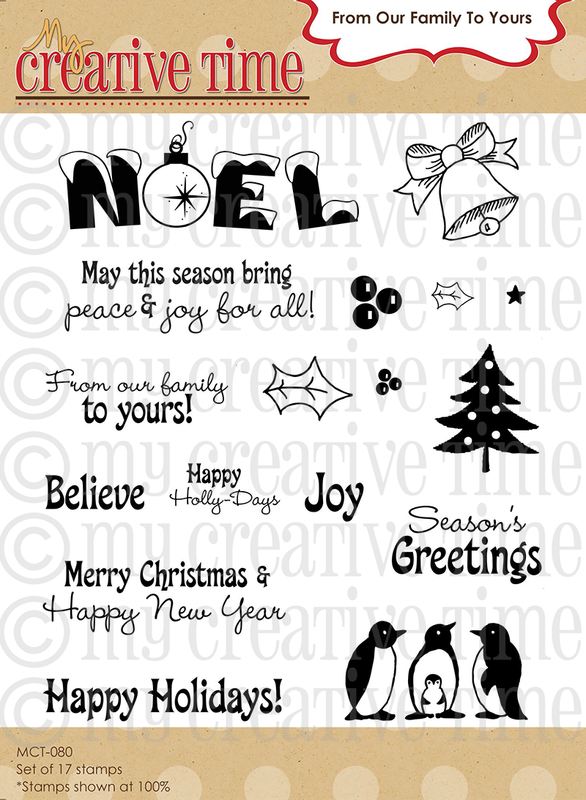 Of course, if you are taking it to family, you can ALWAYS use a different sentiment! The cute little banner is from my latest new die set "Vintage Stitched Label Dies"! I'm not sure if you can see or not, but I also used my "Script Type Background stamp" for the actual kraft color tag! I heat embossed it using clear embossing powder so it can be shiny! Here is a close up of my cute classy lady! She is from "Keepin it Classy" stamp set (my FAVORITE stamp set)! 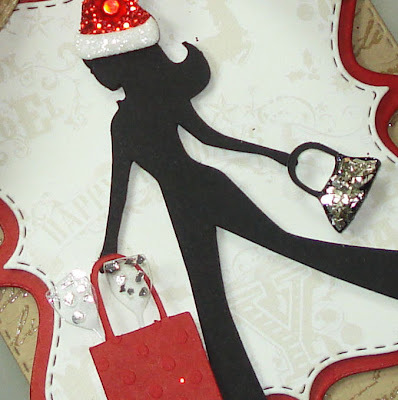 I stamped her, the purse, shopping bag along w/the wine glasses onto a piece of paper, then scanned it into my computer & cut them all out using my cameo! All of these images are from this one stamp set! Aren't the little wine glasses so cute sticking out of her shopping bag? Of course, I had to bling up her purse using glass glitter! I also added a "hint" of glass glitter to the glasses as well! Here is what the tag looks like on the bottle! CUTE....huh? hehehe! ;) I LOVE my products because you can do SOOOO MUCH w/them! And here it is in it's entirety! Emma, what a great way to giveaway gift! The design team has done it again! Thanks for sharing Awesome ideas! Oh my your Wine tag turned out fantastic lovin' it I do have this stamp set and can stamp her in black and attach the goodies since I don't have the cameo just a cute..cute idea!! I really love your stamps. I have as many as I can afford. But, always looking to get more. Put them on my wish list. But, what a giveaway. Hope to win this time. I love your wine tag. My brother-in-law makes wine and gives it out he would love this. Great giveaway. awesome tag! now I need a Cameo! what a gorgeous tag Emma!! 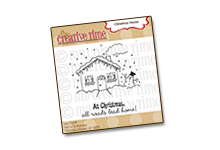 I LOVE how you decorated it with all that bling and of course your stamps and dies are AWESOME!!! Another GREAT gift idea!!!! TFS day 6 and all this awesome inspiration!!! LOVE this tag. I really love when you use the burlap ribbon! Love the creative chick in a santa hat!!! Thanks for all your dreamy ideas! Now you're talking my kind of gift! I love this wine tag. So festive and so fun. 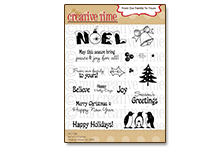 I went on your site after the release of the Big stitched label die and it was all sold out (or maybe it was the reg)....definitely have it on my wish list! Gotta save more money! I love love love this tag. Love the classy lady with her blinged out hat and bag. The burlap bow is beautiful. The glasses sticking out of her bag are so cute. The projects get better and better every day. Thanks to you and your design team for sharing such awesome inspiration. Ooops, I went down to far and posted on Day 5. So let me try this again!! I love how your wine bottle came together Miss Emma!! Now not only do I need to finish buying all your products, but I need a Cameo as well!! lol Been wanting one for a while now. Love, love, love! So darn cute! Your tag is gorgeous, Emma! I love it! Thank you for always sharing such wonderful projects! I LOVE your wine label! What a fabulous idea to add a special touch to a bottle of win - or sparkling cider or whatever. 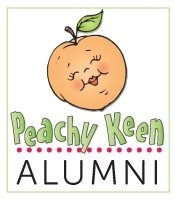 Fun project - and LOVE your design team as always!!! Great tag! The sentiment is perfect with a bottle of wine gift. TFS and thanks for a chance to win! love that tag it's so girly and festive, love all the other DT projects too! When I saw this on facebook this morning I was blown away! You make me want sets of your products when I didn't think I would use them. Everything always looks great and is so versatile. WOW! !AWESOME DT Porjects! !Ladies,You ROCK as always! !Emma,your tag is GORGEOUS!!!Love!Love!Love! Super cute Emma! Thanks for the inspiration!! 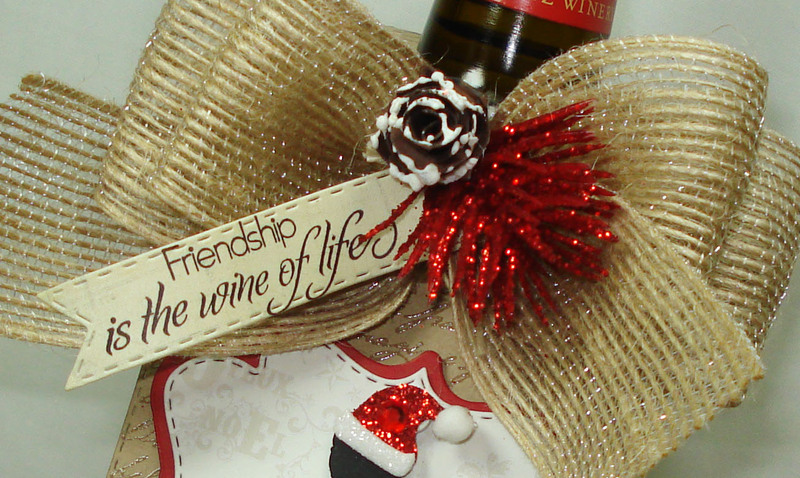 Your trifold die makes a PERFECT wine tag. I can't wait to do this for hostess gifts this year! Sooo pretty. I love all those little things you add to your projects to make them special. It's funny that you dreamed this project. beautiful tags. great ideas. tfs. This is simply Gorgeous, love it! Love the burlap and all the sparkle you added to the tag! Another great job!! I love how simple this tag is but it's so sophisticated!! Design team amazing job as well! The projects are great!! I can't wait to craft tonight! 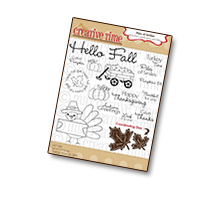 During the week with kids in school, dance practice, & basketball practice & games there's little time to craft! They have 4day school weeks so today is our Friday!! Beautiful job. Very fancy bottle. Design team is awesome too. I love all your creations and this one is definitely one of my faves!! :) Great job ladies,I love seeing what you've all created each day! This came to come out very nice. Your tag is just beautiful. This turned out really nice, love the burlap bow. I wish I could dream up wonderful projects! Oh my gosh, I love your project too - such a fantastic idea!! Great projects by your DT!! What a great idea for decorating a wine bottle. I really like the tag. Thanks for sharing your ideas. Another day of awesome ideas! 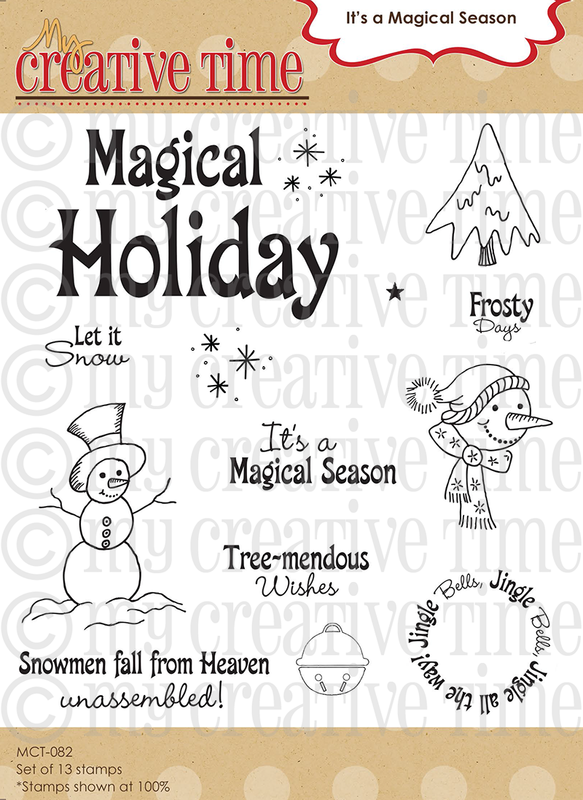 Leanne's card is so unique - who would think that black and white could invoke holiday spirit but it so works! Great job y'all! Emma, you are amazing. That tag on the bottle of wine is gorgeous! Love this project. ooooo I love this project!!! The one Question I do have is or request is please show us how you stamped scanned and cut with the cameo!!! Happy 12 days of Christmas!! I absolutely love that tag. I've been thinking of getting a Cameo. Is it hard to learn? 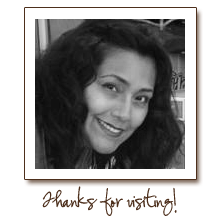 Thanks so much for sharing and the chance to win!! Emma ~ OMG! Shabby, CHIC, GREAT holiday gift idea and PERFECT!! I never knew you could do this with that machine! OMG ~ I need that machine! 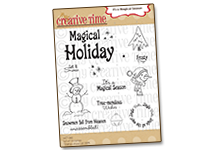 I LOVE the idea we can stamp, scan and cut anything we want!! YEAH!!! LOVE the whole concept, the little santa hat, the blinged up purse the CUTE itty bitty glass in those CUTE little bags ~ alright I LVOE everything now send it on its way to my house!!! LOL Wine too please! The DT's are just ROCKIN these past 6 days! WOW! So many AWESOME and WONDERFUL ideas!!! Adorable wine bottle tag. Love that you are able to cut the girls with your cameo! Just realized that you had two different XL labels - must t=get the one I don't have. Thank you for the video! Miss Emma your are AMAZING!!!! your tag is so beautiful and awesome!!!! Love the idea of dressing up the wine bottle.. Super cute.. As always I love what u do... AMAZING.. Awesome project!!! Love the added bling on it! Super cute! Love love love this one! The Santa hat is so very perfect! Always enjoy reading your stuff! OMG!!! I love this idea!!! I didn't know you could do that with a Cameo...I always learn something new here!! I also have to get that stamp set, my son is always saying keep it classy!! A classy, chic label - from a classy chic lady. Just all adds up to a wonderful project. You and your DT = AWESOME! Thank you for sharing and inspiring. Love what you did with your classy lady. I love this stamp set, too. I'll definitely be making some of these tags! Hello Emm@, share with me the bottle of wine, haha. Amazing project, this is s perfect gift. The designer team made fantastic projects. Thanks for share. Hmmmm a perfect addition to my cork coasters and etched glasses! Looks cuter than the wine bags I was planning on! Great! This is so cool!! I love it but then again I love everything u do!! Thanks for sharing your talents and gifts with us!! This was such a cute project!! 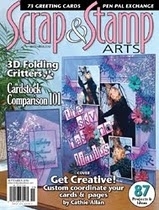 I was wondering if you could do a video on how to stamp, scan and cut images using your stamps. I just purchased a cameo and this would be so nice to see. What an amazing bottle topper you created! I do not own the Cameo so I had no idea you can scan in an image to cut it out like that, what a great way to use your stamped images. 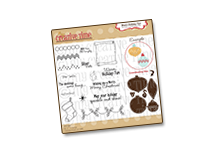 I have your Classy & Fabulous stamp set but not the Keepin' It Classy, I will definitely be getting it after seeing your awesome creation! Oh my gosh, please keep the dreams rolling! What a fabulous project! This is so beautiful.....Love that ribbon! Again, the DT did fantastic!! Very classy tag--I like the burlap bow and your pinecone. Nice tag. Love the ribbon. Neat tag for a wine bottle. TFS with all of us. So super cute. Love how your dies are so versitile. Everyday the projects get better and better. I can't wait for day 12. I am so loving your tag and I love those colors with the burlap. Very pretty. So classy indeed!! Love that you can cut the stamp with the cameo! Thanks for the chance to win the die and the stamps! Emma you knocked yourself out with this classy looking bottle tag. Thanks for sharing such wonderful projects. Your tag is gorgeous!!! Great Job!!! Gorgeous, Emma! Love the hat and purse. Have always loved this stamp. I love silouettes. beautiful projects today thanks for sharing. What a very clever idea Emma, to use it as a wineholder!!! Never thought of that!!! I will use it too!!! Am so "jealous" about your hobbystores...we don't have those cute little Xmas hats here boohoohoo...Love to hear your enthusiasm when you are putting the projects together! And what a clever brother to make these drawing, it runs in the family! 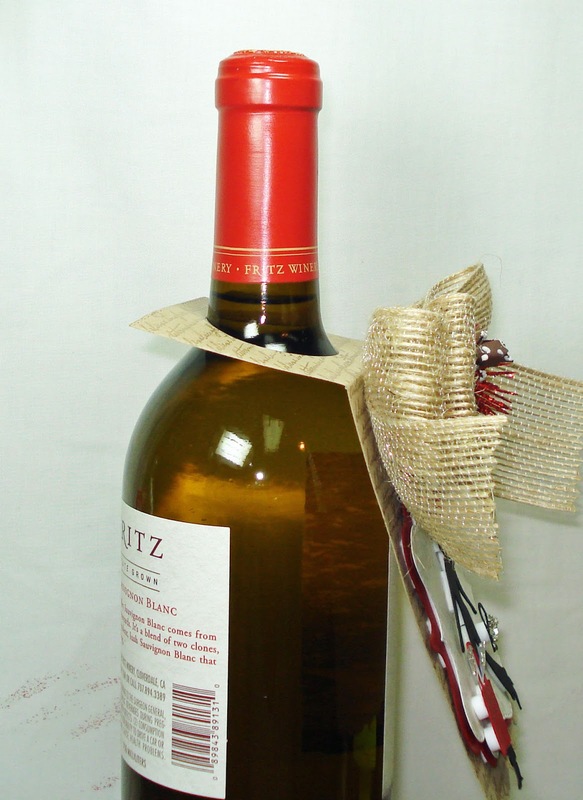 What a great idea for adding a little bling to a bottle of wine! I love all the glitter and the pinecone you added on the burlap bow. Wow! got to recreat this for my favorite girlfriend! She will just love it. Thanks for all your inspiration. What a way to make a bottle of wine special! I love the burlap bow. Thank you and your team for all these great ideas!!! Great way to give a bottle of wine. Really "classy" I love the way you incorporate your dies and stamp. The DT did an awesome job also. Thanks for the inspiration and the chance to win. Looks wonderful, love your girl! Such cool projects! Love your ideas and your designer's ideas as well! Can't wait to try some of these projects! You have the sweetest dreams...What a fabulous tag! Every detail is perfect, right down to her tiny Santa hat. I had no idea the cameo could cut a scanned image. Too bad I am NOT tech savvy! Thanks for the opportunity to win! Cute tag. Your DT did a great job on all the Christmas projects. Those are the most beautiful tags!!! Im totally loving the pinecones!!! This is gorgeous!!! Just what I need to use for my bosses bottle of wine that I need to buy to give her for Xmas!!! I LOVE it!!! Love the burlap.. its fantastic!!! You make the most perfect bows too!!! And I love all the glittery!! The silhouette rocks!!! Very nice project. I may try to do something like this! 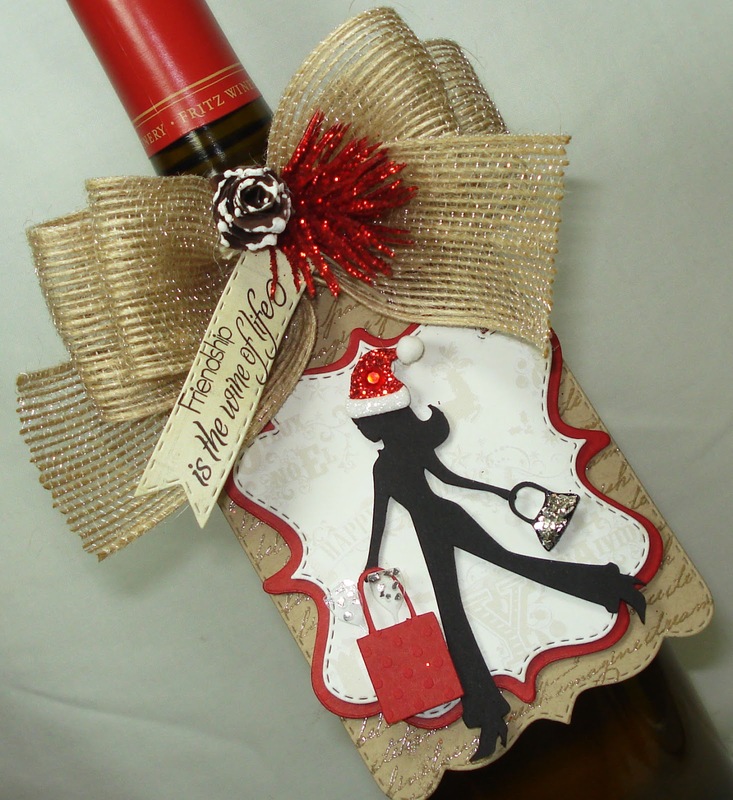 love the bling on that purse - what a great tag for a bottle of wine!! 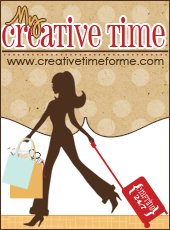 The more I see the lady shopper the more I see all the ideas you can do with it. Love the wine tag also. Yes, that tag is SUPER cute. Love all the details, especially the little wine glasses. Well, that burlap bow is a favorite too! I always give a few bottles of wine away for Christmas and this is such a great tag to add to them, thanks for the idea. Adorably creative gift idea! I need a Cameo!! That wine tag looks gorgeous!!! TFS, LyLy. I love these! Beautiful job! TFS! the hot chocolate cones are way cute! I am so tempted to buy a cameo now. I have my cricut but like the versatility this shows! Very nice. I also love Miss Shar & Miss Cassandra's. So cute. I am collecting ideas for hot cocoa packets. I love all your creations. Thank you so much for sharing. What a perfect way to present your hostess with a bottle of wine. They will love it. 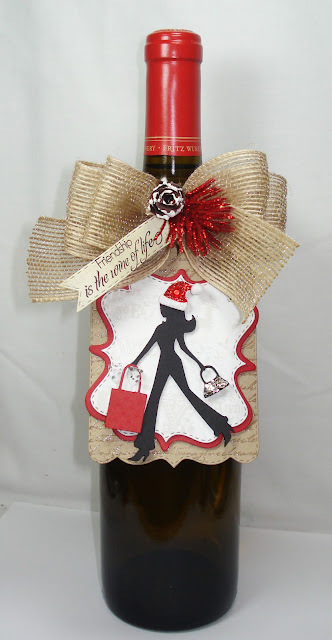 What a fabulous tag for a wine bottle!! . This is adorable! Thanks so much for sharing your talent. Pretty wine tag. Thanks for sharing. Cute wine tag and I love the ribbon. Thanks for sharing. This is one of my favorites! What a great way to decorate a bottle! Now I want a Silhouette. Love these projects too!! So many things to put on my To Do list. My son would absolutely love to give out Snowman soup to his friends at preschool! What a perfect little gift for a hostest. How cute. My husbands boss loves wine and this would make a cute embellishment to put on the bottle instead of just the plain ole bottle. Good idea. I think this is an adorable. It is so cute I'm not sure I would open the bottle. Great idea to gift wine. I'll have to remember that. I am scraplifting this one immediately! What a great hostess gift idea! Thank you! 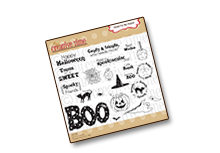 I love this tag and stamp set Im a proud owner of it and love it.